I started this BLOG to acquaint myself with the vast number of new bands and perhaps reacquaint myself with some of my old favorites. The project on the whole has been invigorating. I am enjoying bands which I wouldn't normally buy a ticket to see and taking it a step further by writing about them. And so it was, on Wednesday night, Daddy (that would be me) boarded the Hipster Express (that would be the “L” subway train) to Williamsburg (that would be in Brooklyn). The concert was my first time at the Music Hall of Williamsburg and it was the second time I was checking out a concert only to find out that all the bands were from LA. I guess, as a native New Yorker, I must subconsciously be attracted to a California esthetic. As the evening unfolded, it was apparent that all three bands complimented each other but each had their own musical style . It seemed to me that Local Natives leaned toward Indie Rock, Fool’s Gold toward World Music and Edward Sharpe and The Magnetic Zeros were sort of 60's Folk Inspirational. Local Natives, my personal favorites of the evening, opened up the show with lots good harmonies and energetic rhythms. Everyone sang harmony except for the drummer and all five men handled percussion instruments whether it was a tambourine, drum stick, cow bell, cymbal or the tom they placed center stage. Their songs were driven in an almost tribal sort of way by doubling or at times counter-pointing beats played by the band's drummer. Local Native's songs were more structured than those of the other two bands in the show. But what really made the songs stand out was the mixture of musical elements. They did their cover of Talking Heads “Warning Signs” which I think is a good example of how Local Native's sound is crafted. The song still has it's edginess but Native's arrangement includes vocals with lilting harmonies (6ths), soft jangling guitars and a sort of tribal break. Local Natives is group of 5 musicians. Kelcey Ayer is on vocals, keyboards and percussion – he's the guy in the middle of the stage with the tom next to him. Both playing guitar and doing vocals are Taylor Rice and Ryan Hahn. On bass is Andy Hamm and on drums is Matt Frazier. The group performed 8 songs starting the set with “Camera's Talking” and ending with “Sun Hands.” One of my favorite songs of the set was “Wild Eyes” which I had to look up on YouTube to find out it's name. “Wild Eyes” has the this rapid fire drum turn around that I picked up on and liked. Another notable song was “World News,” I can't figure out why but the vocals on “World News” reminded me of The English Beat and General Public. That's a good thing!! Local Native's music has it's own original character. I hope they come back around soon as headliners. I would definitely like to see what they do with a full set. Members of Fool's Gold laid down florescent lamps of different colors across the stage which they turned on before starting the set with their first song "Nadine." The lights created a cool ambiance for the whole set. As the band first started playing I thought of David Byrne and Paul Simon. But Fool's Gold take on World Music seems more innate than sought out. The range of influences is wide from American to South American to West African to Middle Eastern. It's all in there. But the best thing about Fool's Gold music is it makes you want to either dance, form a conga line or at the very least bop in place as you listen. Fool's Gold's set was as much fun for the audience as it was for the band. I was seated up in the balcony and found two things strangely funny. Before starting a song that he sang in Hebrew, Luke Top dryly asked the packed audience if they had any questions, comments or concerns. It was as if he were giving a lecture or talking to people on tour bus. A very cute moment was when one of the conga players took a camera shot of the audience. I thought to myself, in this age of cell phone cameras, did he do it to remember the moment or was it revenge? Maybe it was both! I recently watched a YouTube video with Alex Ebert and Jade Castrinos of Edward Sharpe And The Magnetic Zero's. Alex basically said in the interview (I'm paraphrasing), that after going through a low period in his life, he could no longer write songs from a place of retribution, rebellion or anarchy. He said he is now coming from a positive child like place where anything goes. He feels that his music is more about being in the moment and not at all about posturing. Prior to Edward Sharpe, Alex led the band Ima Robot. If you look at Ima Robot videos compared to Edward Sharpe videos on YouTube, you can see what the reference to posturing is about. A childlike quality is something I definitely picked up on the moment Alex, Jade and the rest of the band walked on stage. There were moments that seemed chaotic when Alex mulled around a stage filled with musicians between songs. But once each song began, everything fell into place. Alex started the show fully dressed but somehow I knew that like a baby boy who ends up running around the house in just a diaper, Alex would soon end up in only his white pants. Jade loves to twirl around in her peasant dress like a little girl and at certain points comfortably sat on stage in varying lotus positions. Seeing Alex and Jade together made me feel like I was watching John and Yoko back in the early 70's. As I was watching, Edward Sharpe and the MZ's it seemed as if I was witnessing a communal experience. You see Alex Ebert, who towers over the rest of the band in height, has a Jesus Christ looking beard and wears all white. (After Labor day no less!) Surrounding him is a chorus of shinny happy musicians who follow his direction. Then there is the fact that no one in the band is named Edward Sharpe. From what I have read online, Edward Sharpe is a messianic character who came down to earth to save mankind. So at times, it felt like I was watching a cult. I not implying that the band is a cult, It just comes off that way which may be part of the intention. You may have noticed earlier that I attributed a 60s sound to Edgar Sharpe and the MZ's. Primarily, I hear a psychedelic factor which reminds me of bands like Rotary Connection. (A band from the late 60's featuring Minnie Ripperton as one of the vocalists.) All the vocals for Wednesday's set had a major amount of reverb. The same is also true when I have listened to their recordings, there is lots of reverb. In concert the echo was especially noticeable when Alex sang solo. However, both Alex and Jade have wonderful voices. So I'm sure it's a color choice to make their songs have a more spiritual or psychedelic feel. Although I'm sure they have done the same songs 1000 times before, nothing on Wednesday seemed planned. In fact, it seemed more based on Alex's whim. I am pretty sure there wasn't a pre-determined set list or a preset point where their set was supposed to end. From my place in the balcony, it seemed like Alex was walking around stage telling the band what the next song would be. When Jade did her solo song in the set, it was obvious that Alex told her she would be doing it. Jade's song was a definite highlight. Not because it was something different but because Jade has such a wonderful stage presence. She's one of those singers who smiles ear to ear when she sings which radiates to give the audience a warm fuzzy feeling. The band started the set with “40 Day Dream” which has a soulful hook. The song has parts where the audience is totally compelled to clap along. Alex introduced “Janglin” as a child's songs. During the musical intro Alex hopped off stage to take pictures with some of the audience. The band did 9 songs in total. The set wasn't as short as sounds because the songs were long. Once Edward Sharpe finished their set with "Om Nashi Me", it took the band a while to come back for an encore. They finally came back out after playing with opening and closing the stage door a few times. As the band filter out down the steps onto the stage, Edward asked everyone from the two other bands to join them. Together everyone sang along with “Carries On.” The songs lyric started with Alex singing “One love, one love – Carries On” then grows exponentially. The final two songs felt spiritual due to the large chorus of singers. I don't know what the last song of show was – it might have been a reprise of an earlier song or something new. Even so, It was a wonderful ending to a great show. In closing, I need to state that Edward Sharpe and the Magnetic Zeros may not be everyone's cup of tea. The non-posturing stance may come off as posturing in and of itself. Only time will tell how Edward Sharpe And The Magnetic Zeros evolve and are received. With that stated, if you want a show that is choreographed and planned, this band wouldn't work for you. 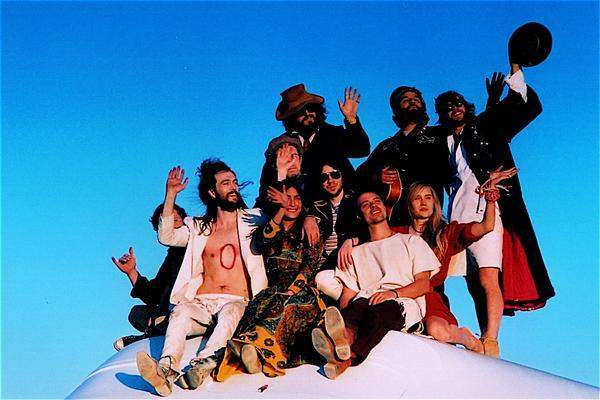 If you want see a band that seems like anything goes with a chorus of people jamming and enjoying themselves – then definitely go see Edward Sharpe and the Magnificent Zeros. Edward Sharpe and the Magnetic Zeros are made up of Alex Ebert on lead vocals; Jade Castrinos doing lead vocals and Percussion; Nico Aglietti on guitar, synthesizer, keys, and vocals; Christian Letts on guitar, mandolin, vocals and percussion; Stewart Cole - trumpet, percussion, keys, tenor ukulele, vocals;Tay Strathairn on piano and vocals; Aaron Older on bass, vocals, banjo and percussion. Josh Collazo on drums, percussion and vocals. Orpheo McCord on percussion and vocals; Nora Kirkpatrick on accordion and vocals. Very odd band. Now that I've seen the vids, I can say I'd rather hear them than watch them. Nice songs. I just read this, and I know it's nearly a year later, but Jade sings Fiya Wata. The name of the song has various names, but according to the iTunes session, it's "Fire and Water" great song... Although, I enjoyed youtube versions of that song much more than the itunes version, the lyrics change a lot, and I love it!